Periya Thiruvandhadhi is another work of the famous Vaishnava Āḻvār Nammāḷvār – one and probably the most popular of ancient Vaiṣṇavite saints. The present poem of Śrī Nammāḷvār consists of 87 verses and also forms a part of Nālāyira Divya Prabandham - also known as Drāviḍa Veda – consisting of 4000 verses altogether. Another, much longer poem of the same - Tiruvāymoḷi we could read earlier. 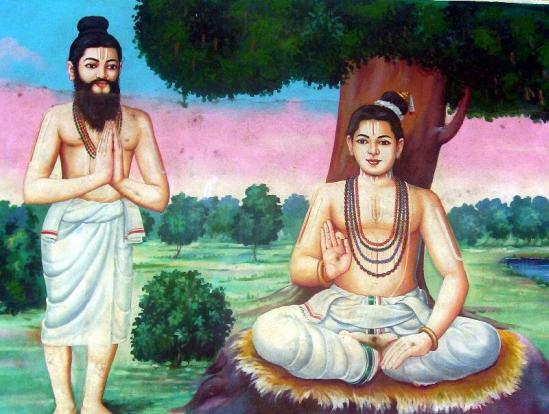 The works of Nammāḷvār were compiled by Madhurakavi Āḻvār as four different works, the Tiruvāymoḷi (1102 verses), Tiruviruttam (100 verses), Thiruvaasiriam (or Thiru Aasiriyam - 7 verses) and Periya Thiruvandhadhi (87 verses). The works of the Āḻvārs are chanted on a regular basis as part of daily pujas and daily practice. The other two, Periya Tirumadal and Periya Tirumoḷi of Thirumangai Āḻvār, are termed Periya due to the length of the work. But Periya Thiruvandhadhi is the shortest among the five Thiruvandhadhi with 87 verses while the other four are made up of hundred verses. It gets this name due to its greatness and the exalted position of the Āḻvār among the Āḻvār saints. All verses are supplied with short explanatory Notes as based on Ācārya’s Śrī Periyavāccāṉ Piḷḷai (1167-1262 CE) commentaries. full flowing beautiful Tāmirabarani river. O' Mind! You are ahead of me in your excitement and enthusiasm about serving the Lord. Please join me in singing the glories of the Lord. Let us sing the kalyāṇa guṇas of the Lord with the hue of the good Pūvāy flower, in poetic verses with apt and beautiful phrases and words arising from the sweet tongue. Āḻvār addresses his mind in this verse. As soon as he instructs his mind to serve the Lord, it got too excited and became enthusiastic and began to get ahead of him. Āḻvār thus addresses his mind to join him in singing the innumerable auspicious glories (kalyāṇa guṇas) of the Lord. O' Lord! If we glorify Thee, it would only amount to insulting (since it would not befit your auspicious attributes). If we do not glorify Thee, then we would not be malevolent. Furthermore, if we think of Thee, we will become discourteous. If we do not think of Thee, we will not be discourteous. O' Lord with the beautiful red eyes who is loving and compassionate! Please listen without any anger. These actions of us, who are of sinful deeds, singing or not singing Thy glories, are the result of our delusion. Āḻvār who stated that he would sing the auspicious kalyāṇa guṇas of the Lord in sweet words, in the first verse, withdraws from the attempt feeling that it is an invincible task. O' Lord! Not glorifying Thee or thinking of Thee is good. Trying to glorify Thee or thinking about Thee is bad. Although I am able to appreciate the nature of these acts, they are however not under my rule. It is not possible for me to either hold on to them or to let them go. What appropriate action is there for me (Thy servant) to do? Āḻvār in the first verse began glorifying the Lord attracted by His greatness. In the second verse, considering the unlimited nature of the Lord's guṇas, he felt quite unqualified for the task and withdrew from his attempt. Since glorifying the Lord would be like insulting Him, not glorifying the Lord appeared to be better. Āḻvār says that although he is able to appreciate the differences between these actions, he declares that they actually are not under his control since the Lord is the ultimate controller and he is dependent on the Lord. My mind is enslaved to Thee, who is my glorious Lord, the dark hued Krishna with great effulgence and whose virtues are vast like the ocean. Furthermore, the most renowned person must be myself alone for who can be more blessed than me? The Lord points out to the Āḻvār that if he withdraws from singing His glories, others will mistakenly conclude that only those who are better than the Āḻvār can praise the Lord and no one will come forward to be His votaries believing that He is unapproachable. On the other hand if the Āḻvār sings His glories, it will stimulate others to follow him. O' my Lord of wonderful powers! If I were to speak (of your grace and blessings) You are like the mother who is always sweet to me. You are also like the father who thinks always of my welfare. You are also my Āchārya, who cares for me. You as a child sucked the life out of the poisonous breasts of the deceitful demoness Pūthanā. How mysterious are Thine ways (of destroying my adversaries)! Āḻvār in this verse thanks the Lord for saving him from his own action which would have resulted in the destruction of his own self. O' Lord who came as Śrī Krishna! Would you keep me away from you by showing all other means or would you reveal Thine divine form dark like the tender mango-leaf? What are your plans for this self of mine, which has been ignorant from eternity? Please give us your word of reassurance and state "do not grieve". Whatever good you may try to do for us, if you leave us to ourselves what harm are we not capable of causing? Āḻvār feels as if the Lord was about to leave him alone - after stimulating interest in his disheartened mind making him feel capable and qualified – and let him take his own efforts to reach the Lord. Āḻvār informs the Lord in this verse, if He should leave him alone thus to himself, it will only brew disaster since he is fully capable of destroying himself. O' Lord! Thou (at the time of churning of the ocean for the nectar) received the divine mother who has a red complexion and is seated on the lotus to reside in Thine divine heart and (at the time of the dissolution) lifted the submerged earth from underneath the deluging waters! My mind on its own accord (without my permission) had become close to the holy divine feet of Thee, the Master. Only my self, who is full of sinful deeds, is far removed from Thee. Āḻvār in the previous verse expressed his desire to see the Lord. The Lord in order to fulfil his desire revealed His resplendent form to Āḻvār 's mind. In this verse, Āḻvār feels sorry expressing his disappointment that he didn't get the same experience, which his mind obtained. O'Lord! Thine attributes are sweet and nectarous. Thou strode the worlds! Thou art subtle and invisible for our gross eyes unrighteous as we are. We are unable to fathom or understand the approach or its means to Thee. We however have developed immense love towards Thee. Please pray tell the reason for this. Although the Āḻvār feels unable to experience the Lord physically, he expresses his mental visualization of Him. This sprouts an immense love in him for the Lord. Thus the Lord appears both as unreachable and accessible. Āḻvār enquires the Lord the reason for this. O' Mind! He (the Lord) is difficult to approach. What is the use of all the time repeatedly saying to the great Lord that we are His servants? From now on, let whatever may happen, let it be so for us (His possessions). Let you be thinking of something or the other about Him. Āḻvār in this verse addresses his mind since his desire to see the Lord directly did not materialize. "What is the use of begging Him? He doesn't seem to want to bless us with His vision". After pondering for a little while, Āḻvār however feels that for this reason he cannot withdraw from the Lord. He then tells his mind, to think something or the other about Him, whether He fulfils his desire or not. O' Good-natured mind! Who are we to reach the Lord of Śrī Lakshmi, who can be obtained only by those who are exalted like the eight Vāsu deities, the eleven Rudras, the twelve Ādityas, and the twin Aśvīns? Of what value is our obeisance, arising from our little selves? Our loss is due to our demerits alone. Wonder indeed that we harbour such hopeless desires. Āḻvār withdraws from the Lord considering himself to be overly zealous without realizing his demerits being lowly and limited and feeling that the Lord is attainable only by celestial deities who are exalted on account of their knowledge and power. The second interpretation is that Āḻvār makes the statement with some disgust in his mind that such grace will only befall the devas who are after various material things from the Lord and not him desiring only the Lord. The third interpretation is that Āḻvār makes similar statement with disgust in his mind that such grace will only befall devas who adopt various other means to attain the same unlike himself who takes the Lord alone as the means. O'Lord! Thou art the floating earth, Thou art the space, Thou art the wind, Thou art the fire and Thou art the water. Thou art the inner controller of all these primordial elements as well. Indeed, Thy valour took the sweet life out of the mighty demon Rāvaṇa, who tried to battle with you on account of his ego. Āḻvār, who tried to withdraw from the Lord citing his demerits, is enraptured by the Lord who showed His nature of being the underlying support of the entire cosmos and His might in destroying the demons. Āḻvār again begins to glorify the Lord attracted by His nature. Āḻvār feels as though the Lord's might that overpowered the demon Rāvaṇa is in some ways less striking than His might engulfing him. O' mind! You are the one striving forever to throw me into the depths of misery. What is the use of repeating the blame game? Let it go. Even when I instruct you about the easy accessible nature of the Lord, you don't accept it being upset with me. Understand that paying benediction on the lotus feet of Śrī Krishna is the most appropriate action (for us). Āḻvār feels sorry for all the lost time (despite the Lord being near), dislikes his mind for not preventing his withdrawal from the Lord. O' Lord! The humble request of mine is not unjust. (Even in this world), righteous masters are seen to fulfil the requests of their servants even if it entails some personal loss. O' Master! Fulfilling my request will cause no loss to you. Accept my humble request and take me as Thy servant and reveal the beauty of Thy divine Form. In this verse, Āḻvār tells the Lord, that if He wouldn't let him withdraw from Him, then He should reveal His beautiful divine form to his eyes. O' mind! Pūthanā, ignorant of the real nature of the dark coloured infant Krishna, being a demoness, tried to kill him by feeding him with her breasts smeared with poison. You repeatedly indulge in self-degrading, sense oriented actions, even when you are fully aware of their effects. This is like sticking your hand into the mouth of the serpent like Samsāra which only leads to demerits. In comparison (to Pūthanā), you are even lower. Āḻvār in the previous verse requested the Lord to show His beautiful form. When the Lord accedes to his request, Āḻvār feeling his lowly self to be unfit to receive such a divine sight withdraws from the Lord, chiding his mind. O' Mind! Ignoring all our misery, if we glorify the auspicious guṇas of the Lord, who is in a state of meditative sleep, his beautiful red eyes closed, lying on the ocean with its roaring surging waves gently rubbing His divine body and the lotus feet, to say that it will somehow defame Him is not correct. Look directly and reflect on this. Āḻvār in the previous verse, withdrew from the Lord thinking of the lowliness of his own mind. In this verse, he tells his mind that if it thinks of its actions, it is befitting to withdraw but if it thinks of the Lord's actions, it can approach Him. O' Lord! If you had not been born poor and not been brought up in luxury and love and not taken the name and form of a "dwarf ", would you not be able to repossess this earth, - that you had as (the great Varāha) once embraced and lifted it out of deluging waters, protected the same from destruction during dissolution and brought it out during the time of creation? Please pray tell the reasons so that we can understand. Āḻvār in the previous verse enjoyed the Lord lying on the ocean of milk in a meditative sleep wondering whether anyone would seek Him. In this verse, he is attracted by His avatāra as "Vāmana" (the divine Dwarf) for it shows how the Lord's willingness even to belittle Himself in order to receive His own possessions. The Lord who once felled the strong glittering mountain like heads of the demon Rāvaṇa scattering them in all directions with the enormous bow, takes the various avatāras with the desire to reach His devotees. The true devotees of the Lord, even when He doesn't appear for them in person despite uninterrupted worship, will never hate nor speak ill of the Lord. Āḻvār in this verse states that the Lord when He reaches out to the sentient beings for their emancipation, even when they ignore Him, He doesn't take this into His heart much. unmindful of any of these hardships, you continue the acts of creating the various forms of the sentient beings allowing them to grow, remaining as the cause of the cosmos. Who can understand Thine ancient form? Please pray tell it yourself! Āḻvār in the previous verse said that the Lord would not develop hatred even when the humans in this mundane world do not heed Him. In this verse, he further states that the Lord will never give up the Jīvas (the sentient beings), even when they cause Him harm out of love or enmity. O' naive mind! If we begin to talk about His qualities, they are limitless. In this ancient land, during the great Bhārata war, placing the five helpless Pāṇḍavas as the enemies of the great army of the Duryodhana, did He not protect them day and night? Āḻvār in the previous verse, described how the Lord protected the devotees in His youth as child Krishna. In this verse, Āḻvār describes how He sheltered His devotees when He grew up. If we wish to see the beautiful form or talk about the deeds of the gracious Lord who as a dwarf mendicant received as gift all the worlds (from the demon king Mahābali) and graced the same by pervading them (as Trivikrama), should not our good mind with intelligence feel ashamed? Although in the previous verse, Āḻvār says to his mind "See", in this verse he points out that compared to the desire and the eternal efforts that the Lord takes to repossess the wayward Jīvas, our desire to see Him or reach Him is so infinitely small and therefore should make our intelligent mind feel ashamed. The lotus feet of the Lord with the hue of the dark clouds, placed on the sacrificial land of Mahābali, at that time, grew and expanded, pervading all the worlds, making this earth and its surrounding oceans disappear from the sight. Today on this earth, the same divine lotus feet engulfed my mind to protect me from falling into the terrible hell (the mundane life - Samsāra). Āḻvār in this verse expresses his wonderment as to how the divine lotus feet of the Lord that once spanned the worlds came to be entrapped in his mind. The main reason for this of course is the Lord's desire to protect the Jīvas from the clutches of the Samsāra (the mundane life). The sovereign Lord entered and engulfed my mind. All my unrighteous acts and their effects, which have been ruling over me with great pride from before and torturing me, unable to find space to subsist, appear to be screaming, weakened as they were from running here and there. Āḻvār , in this verse, describes how all the unrighteous "karmas" and their effects automatically vanished once the Lord entered his mind. O' mind! (Not holding on to the Lord), may you be weak or (holding on to Him) may you be strong. I give you this invaluable teaching. The Lord is (truly) the mother and the father for all beings, whether He protects us or not from the weakening effects of the hard grips of the attendants of Yama (the deity of justice) and their unleashed dogs. Āḻvār in this verse tells his mind that the Lord is the ultimate Saviour whether one holds on to Him or not, therefore its duty is to take Him as the refuge whether He protects or not. The Lord alone takes several peerless incarnations. He has no compeers. He also is the inner controller of all other beings. If He ever withdraws from His acts of protection even for a minute, the world will go upside down. After dissolution, when He brings forth again this entire creation out of compassion for the trapped jīvas, who on this earth can fathom all His deeds of protection? Āḻvār in the last verse stated that the Lord alone should be taken as refuge because of our natural relationship to Him, whether He protects us or not. In this verse, Āḻvār by his arguments, proves that the Lord alone is the protector and therefore there is no question of Him not offering shelter. Let who ever do whatever. Will it ever be possible to search all over this large world and correct people's actions? (I am happy that) I got rid of the terrible owes of the mundane life from my mind, which has the wealth of being the residence of the Lord, due to the divine grace of the sovereign Lord of the eternal beings, who took birth as the loving Śrī Krishna (Kaṇṇaṉ Empirān). Āḻvār in his previous work has tried to give advice and change the people of the world. Some people began to question Āḻvār as to how far he succeeded in his efforts to change the world. In this verse, Āḻvār gives his reply. In the last verse, Āḻvār stated that the Lord is the ultimate refuge and shelter for all. Despite this, since the Lord has given freedom in actions to the sentient beings, all His efforts do not always take effect in the majority of beings. Āḻvār also feels here that even if he tries to correct their ways, no one cares to listen. In this verse, he expresses his happiness, that the Lord's efforts have taken effect in his case. Śrī Periyavāccāṉ Piḷḷai compares Āḻvār 's happiness to that of someone who escaped with his precious treasure from the way-side robbers. Myself and my mind consented to have our terrible karmas chased out into the forests and the mountains, beaten by the rod of grace showered by our Lord with the great divine form with the hue of darkness itself. Āḻvār in the previous verse, stated how he got rid of the terrible owes of the samsāra, with the help of the divine grace of Śrī Kaṇṇaṉ Empirān. In this verse, he states clearly that his contribution in this is one of merely consenting to the Lord's intervention. O' Sovereign Lord! Your beautiful divine face brimmed with happiness, that time when you grew as Trivikrama, spreading your divine feet, adorned by the anklets, all over. Was your joy because thine divine feet measured this earth or because your crown measured the space? We do not know! What a wonder! Āḻvār in the previous verse indicated that he became blemishless and that this was achieved through His grace. Therefore, the only thing left now for the Āḻvār was to enjoy the Lord. He begins to enjoy the Lord in this verse. That divine form of the Lord, which cannot be seen by the physical outward eyes, if the inner mental eyes ever are able to understand and visualize, then and there even the outward physical eyes will be able to see that divine dark form of the discus carrying Lord. We have not seen Him as yet today (for we haven't visualized Him with our inner mental eyes). Āḻvār reminded of the beautiful divine form of the Lord (Trivikrama) who took the giant strides, wanted to visualize that form, but was unable to do so. Āḻvār after a moment of thought, states that the reason for our inability to see His divine form is our deficiency and not that of the Lord. The nature of My Lord, who is adorned by garland of blossoming Tulasī flowers, is not easily knowable to everyone. He has love for His devotees to the extent of their love for Him. For myself, who have abundant love for My supreme Lord, He will remain easily accessible and reveal His form even in this world. Āḻvār in this verse, says that supreme peerless devotion (Para-bhakti) does not develop easily for everyone. Āḻvār says that since he has developed such a state of "Para-bhakti" for the Lord, the Lord will easily reveal Himself to him. Unlike the old days, there is no room in my mind for my unrighteous karmas to reside anymore. For my mind is small and is overfilled with the auspicious guṇas of my Lord with the red eyes. It is better for my terrible unrighteous karmas (which ruled over my mind before), to step out and leave my mind than to hang on trying to squeeze into it. Āḻvār in this verse says that there is no place anymore in his mind for the "karmas" that have been eternally causing harm and hindrance to attaining the Lord, now that the Lord's kalyāṇa guṇas have taken hold of his mind since he has been contemplating on them. Contemplation of the auspicious guṇas of the Lord, leads to the elimination of the unrighteous karmas (sins). This is the inner meaning of this verse.